Everything you need to make the satisfying dish of baked Camembert. Ideal as a shared starter for a dinner party. An mouth watering selection containing everything you need to make the satisfying dish of Baked Camembert. Why not make this an extra special gift by adding one of our large gift boxes? 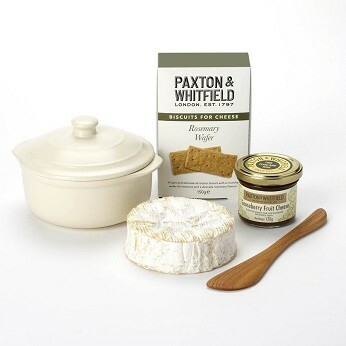 Box contains: Recipe card, Camembert de Normandie PDO 250g (unpasteurised, traditional), Cream Ceramic Camembert Baker, Beech Wood Spreader, Paxton & Whitfield Rosemary Wafers 150g and Gooseberry Fruit Cheese 120g.